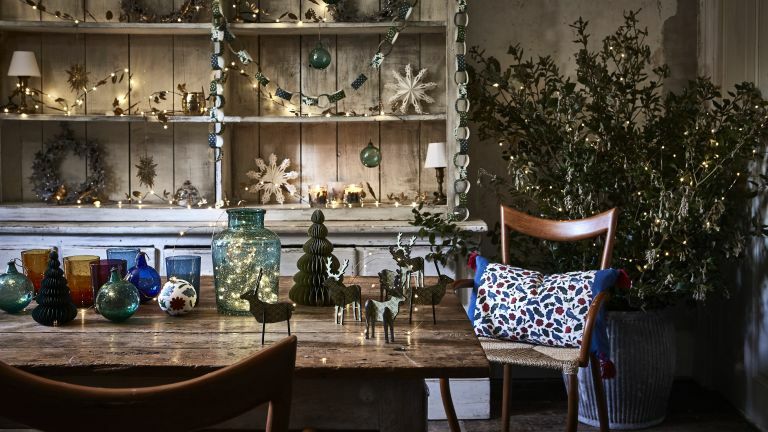 Looking for traditional decorating ideas to brighten up your festive season? You just can’t beat a traditional Christmas, despite our enthusiasm for kitsch decorations, alternatives to Christmas trees, and contemporary baubles. The smell of a real pine Christmas tree, handmade decorations strewn up everywhere, chestnuts roasting on an open fire and all that... Get this cosy, festive look yourself with our ideas for creating the perfect traditional Christmas. Obviously. The more homemade looking the better. And if during all that mulled wine drinking and mince pie eating, you can’t find the time to make your own, these beautiful felt wool stockings from Jan Constantine will definitely do the trick. Ah, just look at that regal banister. Whether fake or real, foraged or shop-bought, an evergreen-laden banister has an incredible amount of merry-making, festive power. And don’t just stop at the greenery, you can add even more festive feels with ribbons, lights and baubles. Red and green. You just can’t go wrong. Trusty Marks & Spencer have got this look covered with their offerings this year. Our favourites are the mini knitted Christmas jumpers and these adorable Nutcracker baubles. Red and green may be the quintessentially traditional Christmas colours but why not go rogue with a metallic colour scheme this year? We think this sparkling silver tree, decorated with warm lights and glistening decorations from The White Company is still very in keeping with a more traditional style. It’s such a lovely idea isn’t it? Spending a frosty Sunday afternoon all crowded around the kitchen table cutting out paper snowflakes. You could of course just cheat and buy them from Ginger Ray. Then try combining your paper decs with a mix of wooden and metal stars, like the ones from NOTHS, for a very festive, three dimensional gallery wall. January sale! For a limited time, save 42% on a subscription to the UK's best-selling period homes magazine . It offers all the inspiration and advice you need to get your projects off to a great start in 2019. Bringing a bit of the outside in at Christmas always makes a home feel extra cosy (plus it's a super cheap way to decorate).There’s something very traditional about foraging around your garden (and the neighbours' hedges) to find bits of holly and ivy to string along the mantelpiece. And if you can’t recreate this look from actual bits of nature, fake it with an artificial garland. We reckon there is something undeniably traditional about the kitschy decorations that are very in this Christmas. They remind us of the homemade Christmas decorations we used to bring home from school – wobbly dough Santas covered in glitter and drunken looking angels sprouting feathers. While these lovely glass baubles from The Contemporary Home are a bit less… rustic than our offerings they still bring out the nostalgia. Does it get any more traditional than a classic evergreen wreath with jolly red berries? Of course you can make your own but if you are after something you can bring out every year, we say go for this Red Berry Wreath from Lights4fun. Looks pretty real to us. Because you wouldn’t want your non-festive, boring, everyday cushions bringing down your Love Actually marathons would you? Spread the festive cheer even further by changing up your sofa cushions. We love these really cute, textured cushions from John Lewis and Partners. While a lot of traditional Christmas decorating ideas revolve around plenty of evergreen, you can always fake the feeling of walking in Narnia with artificial trees. There are some very convincing, affordable options out there. Miss the scent of pine? A few delicious smelling Christmas candles should do the job. Re-create this opulent table setting by strewing about some berries, pinecones and sprigs of evergreen. Choose some vintage (or just vintage looking) tableware and finish it all off with some simple pillar candles in glass jars. So we've covered the inside, but what about decorating the exterior of your home? We are all about warm coloured lights, nothing too bright white if you are going for a more traditional look. String them around your doorway for a warm welcome, get the ladder out and drape them through the trees and don't forget to hang lights at your windows, too, just to add to that lovely festive glow. Want more Christmas lighting ideas? Check out these festive fairy light ideas. When it comes to decorating, why limit yourself to just downstairs? Get that festive feel in your bedroom too! Switch out your bedding for a traditional tartan like this set from Zara Home – not too full on Christmas that it will look odd come January but just festive enough to give your bedroom a holiday update. Make like the Victorians and use everyday food to decorate your home. Stick some cloves in an orange, thread some popcorn onto a string or dry out some citrus fruits – not only do they make for lovely budget decs but they also make your home smell amazingly festive. Looking for more Christmas decorating inspiration?